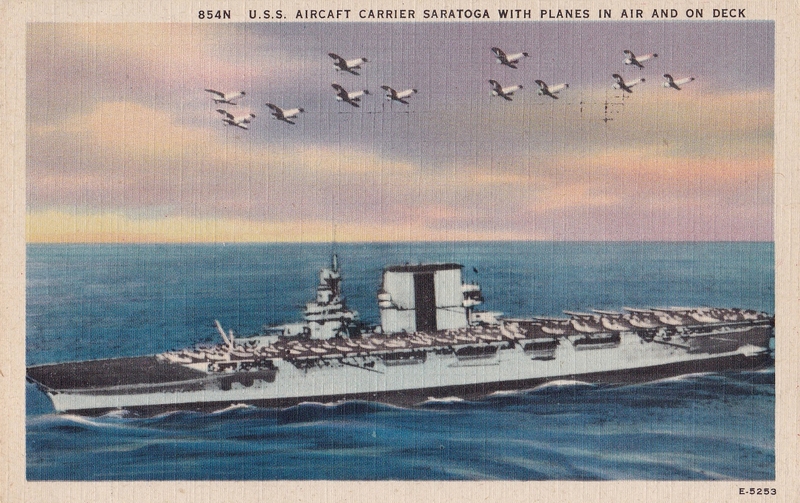 Another interesting postcard that got scooped up from the antique store is a postcard of the USS Saratoga, postmarked 11/24/1942. It was sent from San Diego, CA. According to the Wiki article on the ship the Saratoga would not have been at San Diego at the time of the postmark. She would have been on a cruise toward Nouméa, New Caledonia and then on to the E. Solomon Campaign in early 1943. The Saratoga was a Lexington Class Aircraft Carrier (converted from a Battle Cruiser) and one of the four pre-WW2 carriers. The other three being the Enterprise and Ranger and Lexington. The Lexington was scuttled after the Battle of the Coral Sea where she suffered damage that could not be repaired. The Saratoga would see extensive action in the Pacific War and be torpedoed twice and kamikazed/bombed once. Her air complement by 1945 was 53 F6F Hellcat fighters and 17 TBF Avenger torpedo bombers. After the kamikaze attack during the Iwo Jima Campaign the Saratoga returned to the US for repairs for the final time. By then she had been replaced by more modern carriers and was obsolete. She was used thereafter as a training ship and ended up being used in the Bikini A-bomb tests where she was eventually sunk after two tries. The postcard appears to be of pre-WW2 vintage as the planes above the Saratoga look like bi-planes. Wiki notes that the Saratoga carried 18 Grumman F2F-1 and 18 Boeing F4B-4 fighters, plus an additional nine F2Fs in reserve. 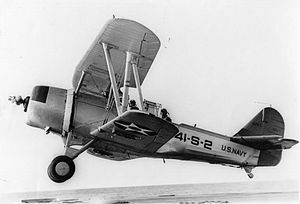 Offensive punch was provided by 20 Vought SBU Corsair dive bombers with 10 spare aircraft and 18 Great Lakes BG torpedo bombers in 1936, all bi-planes. 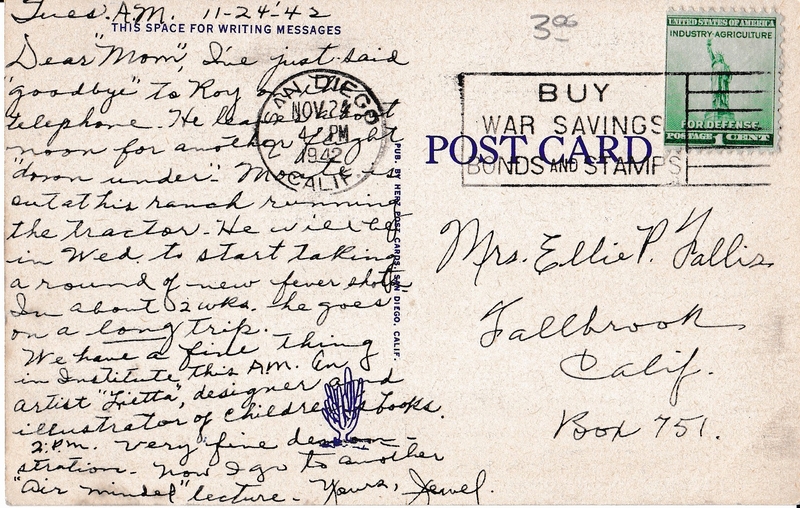 The the back of the postcard is intriguing. The message is fascinating and Pearl’s use of quotation marks suggests attempts at communicating without getting sensored-in other words a type of code she hopes Ellie understands. My best guess is that Roy is her husband and she refers to Ellie as “mom” in quotes for that reason. Roy appears to be stationed in Australia with “down under” being code for it. I cannot surmise much about Monte other than assuming he too is on service and about to get more shots, probably for malaria or dengue fever and host of other tropical diseases before he ships out. Whoever Monte is he has a ranch and drives a tractor. “Lietta” is Helen Dowd an artist who branched out into illustrating a number of children’s books between 1936-1954. My guess she was at the San Diego Naval Base to either lecture or do an exhibit for service personnel and/or their wives. Jewel notes that she needs to go to an “air-minded” lecture perhaps having something to do with the Navy explaining what a pilot does and what she could expect as a pilot’s wife. Whatever the case the postcard is intriguing and speaks of wartime San Diego and the people connected with the Saratoga either directly or indirectly. 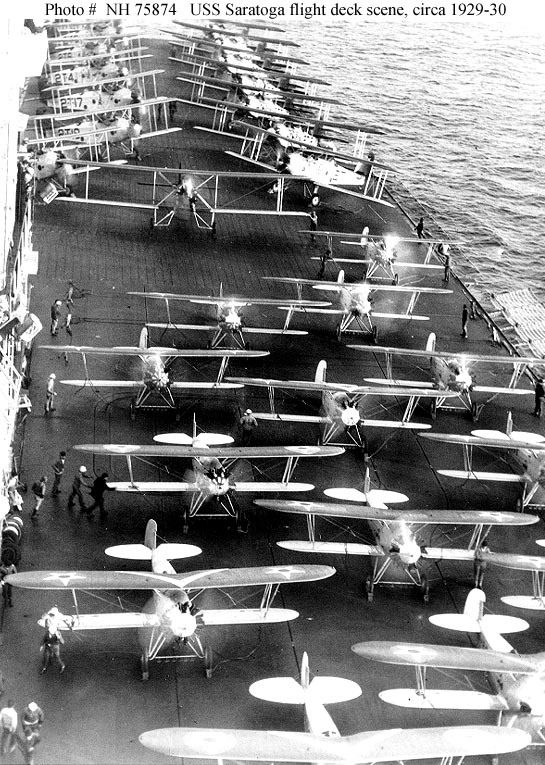 Aircraft on the flight deck, preparing for launching, circa 1929-30. Planes in the foreground are Boeing F3B-1 fighters. In the background are fifteen Martin T4M-1 torpedo planes, of Torpedo Squadron Two (VT-2B). Courtesy of the Naval Historical Foundation, Washington, D.C. Collection of Admiral William V. Pratt. Thanks for stopping by Mike. I just started my quest for old postcards recently and am especially intrigued by the colorized versions that were made before color photography became available. Good luck on your quest, it’s a lot of fun especially when you find one with writing. I’ll double check about the “station” or “demonstration” the eyes are not what they used to be. What would be the value of this postcard unused? I have one….K.C. I’m sorry Kenneth but I have no idea. I’m not really a collector. If I see something cheap enough at an antique store (under $10.00) and it’s a military subject I’m interested in I’ll buy it. All I know is subject matter and condition drive the prices up. If memory serves me I probably paid $10.00 for the Saratoga.